With 2015 just a few days away, we're on the verge of another big deluge of superhero cinema and television; from Agent Carter, the return of The Flash, Arrow, and Agents of S.H.I.E.L.D. from their mid-season hiatuses to the Fantastic Four reboot, the big-screen debut of Ant-Man, and of course the giant, sure to be mega-hit The Avengers: Age of Ultron. Despite all of that varying level of excitement, the endeavor that most has me running around my office in excitement is the upcoming Netflix series based on Marvel's hero of Hell's Kitchen: Daredevil. 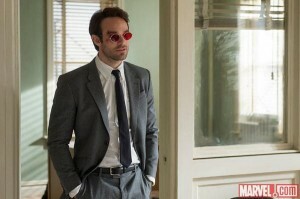 The first of four series (that also include AKA Jessica Jones, Luke Cage, and Iron Fist) before leading into The Defenders event miniseries that ties all four shows together, Daredevil has been filming since July of this year and stars Charlie Cox as Matt Murdock/Daredevil, Vincent D'Onofrio as Wilson Fisk/The Kingpin, Deborah Ann Woll as Karen Page, and Elden Henson as Foggy Nelson, among others. The series is show-run by Steven S. DeKnight (Spartacus) and was developed by Drew Goddard (The Cabin in the Woods). Within the Marvel universe there are thousands of heroes of all shapes and sizes, but The Avengers are here to save the universe and Daredevil is here to save the neighborhood. 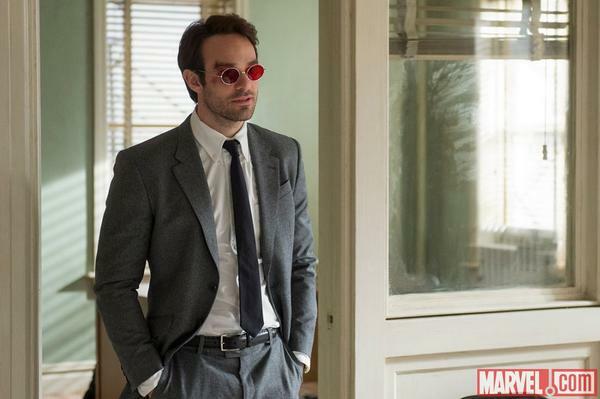 It’s a very unique look at Hell’s Kitchen in New York, where Matt Murdock grew up and continues to defend it from people who would harm the people that live there. Fisk has very many different aspects so it’s not all, ‘I want to conquer the city and make a lot of money.’ In our story, we tell the story of how he met his wife Vanessa and how they fell in love — our antagonist actually has a love story. That’s the love story you’re following, the one you’re invested in, and seeing how that affects him and changes him. I think Vincent just brings such depth to it, his performance is just astounding. That very love story played a big role in the Frank Miller run, though I doubt we'll see any sort of sewer dwelling mutants (or whatever th e Marvel Cinematic Universe equivalent will end up being). We really wanted to take our cue from [films like] The French Connection, Dog Day Afternoon, Taxi Driver, and make it very, very grounded, very gritty, very real. We always say we would rather lean toward The Wire than what’s considered a classic superhero television show. It should be pointed out that this is not terribly far off from the take that director Joe Carnahan was aiming for when he was attached to the property when it was still under Fox's umbrella. You can check out his old concept sizzle reel here, but be forewarned, it's a bit violent. I wouldn’t say there’s no plans to include [Bullseye] in the series. It’s not not to say he wouldn’t be in the series at some point. But I think if you try to jam in too many characters, it just becomes a mess. And [Bullseye’s] story was told in the last iteration of Daredevil that anybody saw. My feeling was, ‘Why repeat it?’ And honestly, if you’re looking for a juicy, multi-faceted crime drama, Wilson Fisk was the obvious choice to play the antagonist. Bullseye is a little more cut and dry. Not to say you couldn’t make him fantastic over 13 hours, but Fisk really felt like the right yin to the yang for Matt, and for what we wanted to do this season. There's no specific release date for Daredevil as of yet, but we know its coming in May of 2015. As with most Netflix original programming, I expect to have it all binge-watched within 24 to 48 hours myself, provided its actually good of course.